It’s been a long period of time since I’ve posted and updated my blog. I was very busy with my personal life and didn’t had extra time to spend working on the blog. 😭 But, I’ve definitely been keeping up with news about Super Junior (still fangirling hehe) and Kpop through Twitter. 😍 So, whenever I have time now, I’ll update with links of videos that I’ve found/watched that haven’t been posted on my blog before. I’m planning to post links of newer videos first, and then go back to posting older ones and fixing links of older shows if other videos are still available. Since many videos are frequently being removed from streaming sites (like YT and DM), I know that a lot of the older links that I’ve posted are broken and I’ve noticed all the comments letting me know about them. I’ll try to find alternate video links for those removed videos whenever I have time and update those posts. However, unfortunately for some of the older shows, most of them aren’t re-uploaded by anyone again so I won’t be able to add new links. 😥 Once again, thanks for commenting, liking and sharing my posts, and following my blog. 😀 Many comments were left on the posts and I’ll definitely reply to all of them in the coming days. Please do not hotlink the images that I’ve posted on this blog. Hotlinking means that you used the direct link or url of an image to post or share the image on another forum or blog. If you like a picture that I’ve posted and would like to share it somewhere else, please save the image onto your computer and then upload the saved image to a photo sharing site (such as Photobucket or ImageShack) and share it using that link instead. If anyone has hotlink an image before, I’ll really appreciate it if you could use the method I mentioned to share that image instead and refrain from doing it in the future. If others hotlink my images, it causes me to exceed the bandwidth on my Photobucket account and then prevent the images from appearing on this blog. I also want to mention that due to school and work, I don’t have much time to post and update video links of shows on my blog. >.< So, I won’t be posting and updating my blog as much. Vote for Henry & Super Junior-M for Mnet 2013 20’s Choice!!! You’ll be kept updated with new posts and edits to previous posts through my FB acct as well as through my Twitter (@superzvicki) and being subscribed by email. 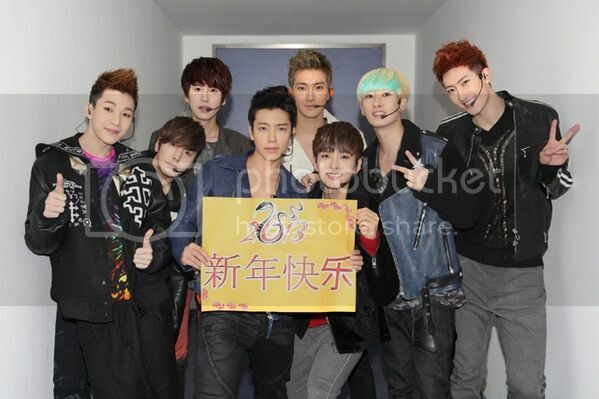 Today is the 1st year anniversary of my site (Love Super Junior 13+2 ♥ / https://superzvicki.wordpress.com/), and I’m super happy!! ^__^ My blog was officially opened to the public last year on Jan. 2, 2012, though I was already working on the blog several months beforehand. Wow, it definitely felt like time passes very quickly sometimes, as it has already been a year since I’ve made this blog public and have been updating and posting links of English subbed Super Junior videos. Thank you to all my subscribers, Twitter followers, and readers/visitors of my blog for visiting my blog so often and leaving nice and encouraging comments. Even though I couldn’t update and post links on my site as often as I like to due to lots of schoolwork and personal responsibilities, I’ve like to thank everyone who have continue coming to my blog and sticking with me (even through my hiatus last summer for vacation xD ). I’m really happy that my site is a helpful resources for ELFs and other kpop fans as well for finding links of subbed videos. And as an ELF, this is one way that I’m trying to spread the love for Super Junior, as some of the biggest charms of SuJu are how hilarious they are on variety shows (watch them on days when you’re feeling down or sad, and SJ will definitely make you feel better and laughing again 😉 ) and their amazing music that I love listening to. If you like my blog and find it helpful, please help me spread the word about it and let others know about my site. And lastly to celebrate my 1st year anniversary of this site, I’ve decided to change the theme of my site. 🙂 What do you guys think about the new theme?? Isn’t it cute?? Do you like this new theme better or the old one? Also, since I’ve switched themes for the site, I’m worried that some posts/pages or some parts of the site might appear weirdly: like the words on some posts may be missing, cut off, hard to read or the pictures are missing from the posts, appear weirdly, or the embedded videos aren’t showing up. So, please let me know if there’s anything wrong or weird with the site or with any of my posts/pages by leaving a comment below, it’ll be really helpful to me as I’m trying to work with this new theme. Vote for every category. One ID can only vote once per day. 2012 MTV EMA Voting Information – How to VOTE & about the different rounds! **UPDATED 121007!! Read the second half of the post!! Super Junior and Hangeng have been nominated in the the Best Asia Act for the 2012 MTV EMAs that will take place in Frankfurt, Germany on November 11. The Best Asia Act category is part of round 1 in the Worldwide Act. Voting for the Best Asian Act starts on 12:01am CET on 17 September to 23:59pm CET on 14 October. The winners of the Best Asian Act category will move onto the Worldwide Act Asia Pacific category (round 2). Voting for the Worldwide Act Asia Pacific category starts from 12:01am CET on 15 October and ends 11:59pm CET on 29 October. – Updated Immortal Song 2 until the most recent English subbed episode, Ep 60. * NOTE: To subscribers of my blog, I sincerely apologize for spamming your email with multiple emails of new posts at the same time, I’m really sorry. I created these posts at different time, but to avoid confusion for myself on which episode I still need to create a post for, I’ve decided to publish all the posts at the same time. – New Strong Heart episodes with English subs added. Hi everyone! 🙂 I’m back from vacation and starting to update the blog with new posts of variety shows with Super Junior. Thanks to everyone who visited my blog (83,520 views overall xD ) and for the people who left comments about broken links and other stuff, I’ll definitely reply back, but it might take me some time as currently I’m busy with schoolwork since I’m taking lots of hard classes this semester. So, I won’t be able to update as frequently as I would like but I’m definitely going to try my best to keep this blog updated with any new links I find of English subbed variety shows with Super Junior.